It was a 1970s-era Beaulieu Vineyards Private Reserve Georges de Latour. That was the wine that made me fall in love with Napa Valley Cabernet Sauvignon many years ago. I was thrilled to attend this dinner at Press in St. Helena built around a number of reference-point Napa Valley Cabernets. We ordered a number of appetizers and entrees and shared them family-style. Everything was delicious, even if our attention was naturally focused on the wines. The crab, salmon and Flannery’s rib-eye were all dishes I would devour again with great pleasure. There were far too many wines to list individually, but these were some of the many, many highlights. The staff at Press headed by Sommeliers Kelli White and Scott Brenner was attentive to our every need, not an easy task with this group. Since this dinner, Press has completed a major expansion of their cellar. The list is rich in gems ranging from many of the classics, to extensive selections from some of Napa Valley’s more recent superstars. I can hardly wait to go back. The 1978 Stony Hill Chardonnay has held up beautifully. It was long, pure and elegant, with gorgeous floral and honey notes on the finish. Though fully mature, the 1978 also showed no signs of imminent decline. What a bottle! The 1959 Louis Martini Cabernet Sauvignon Private Reserve was also great. It was naturally quite delicate and ethereal, but still revealed lovely depth and a layered, sensual finish. The 1967 Cabernet Sauvignon from Mayacamas impressed for its density and the sheer integrity of its fruit. This was a terrific showing. Collector Wilf Jaeger, who possesses a staggering knowledge of the wines of California and Burgundy, brought along a set of four wines from Inglenook. The 1960 Cabernet Sauvignon Cask F-9 was quirky but fascinating. It showed marvelous intensity for a 50 year-old wine. The aromas were a bit on the oxidative/volatile side, but it was impossible not to admire the wine’s richness. The 1961 Cabernet Sauvignon Classic Claret impressed us with its intensity and expressive inner perfume. It was a touch on the lean side next to some of the other vintages of the same era, but here, too, there was much more to like than not like. The 1962 Cabernet Sauvignon Estate Bottled was at times powerful, and at others more delicate. It flowed with a distinct profile of sweet red fruit, espresso and crushed flowers. The 1963 Cabernet Sauvignon Estate Bottled showed the best composure and harmony of these wines from the 1960s. The balance of fruit and structure was fabulous. What a gorgeous, elegant wine. The next flights, which focused on one of the golden ages of California Cabernets, were stunning, The 1973 Sterling Cabernet Sauvignon Reserve was insanely beautiful. At nearly thirty years of age, it still possesses great aromatic complexity, nuance and tons of fruit. The heady, full-bodied style was unmistakably Napa Valley. The 1973 Cabernet Sauvignon from Mt. Eden was equally brilliant. It was perhaps a touch richer, deeper and more powerful than the Sterling, but what stood out most was the wine’s intense, brooding personality. The 1973 Chappellet Cabernet Sauvignon came across as incredibly tight and powerful, with considerable upside still to be realized! Tar, licorice, smoke and a host of dark aromas and flavors lingered on the finish. It was a towering Cabernet. Eisele Vineyard is one California’s grand crus. These two wines from the 1970s, when Joseph Phelps was buying the fruit, make an eloquent case for the greatness of this site. The 1975 Joseph Phelps Cabernet Sauvignon Eisele Vineyard was massive, towering and a real show stopper. It boasted tons of dark fruit, plenty of supporting structure and a big, vibrant finish. The 1978 Joseph Phelps Cabernet Sauvignon Eisele Vineyard was almost as stellar as the 1975. There was plenty of muscle to the 1978, but it showed a bit more of a medium-bodied personality. Layers of sweet red fruit, mint and eucalyptus wrapped around the long finish. Our three wines from Diamond Creek were fascinating. The 1975 Cabernet Sauvignon Volcanic Hill was a bit of a bruiser. Actually, it was simply a bruiser, but still a gorgeous, striking wine loaded with fruit and massive structure. Hints of mint, crushed flowers and eucalyptus lingered on the firm, virile finish. The 1978 Cabernet Sauvignon Red Rock Terrace was a bit more forward and resolved than the 1975 Volcanic Hill, but with these intensely tannic wines, that wasn’t a bad thing. I loved the silky, polished finish. The 1977 Cabernet Sauvignon Red Rock Terrace returned to an austere style marked by hard tannins. It was an eccentric wine, yet it had aged quite well in its own way. None of the three Cabernets from the 1980s offered much in the way of real excitement, at least not next to the other wines on the table. The wines had aged well, but they were largely devoid of true personality and character. The 1988 Spottswoode Cabernet Sauvignon came across as quite pretty and delicate, with soft fruit and good balance. Joseph Phelps’s 1985 Cabernet Sauvignon Eisele Vineyard was similarly soft, but also simple, especially when compared with the mythical wines of the 1970s. The 1987 William Hill Cabernet Sauvignon Reserve was open, accessible and delicate, but not complex. Things got back on track with a stellar flight of wines from the 1995 vintage. David Abreu’s 1995 Madrona Ranch was breathtaking. It burst from the glass with tremendous length and layers of voluptuous, ripe fruit. Though still a youngster, the 1995 was immensely enjoyable. Philip Togni’s 1995 Cabernet Sauvignon came across as big, powerful and brooding. Blackberries, asphalt and sweet herbs lingered on the finish. The 1995 is an epic, towering Cabernet from Philip Togni. I hope to taste it again when it is closer to peaking. What a great wine. The 1995 Spottswoode Cabernet Sauvignon was quite a bit more graceful and feminine in this context. It showed lovely purity and an open, accessible personality that made it quite approachable. Freemark Abbey’s 1995 Cabernet Sauvignon also did well. It was much riper and opulent in style than the vast majority of the wines on this night, but what came across most was its grip and long, focused finish. The 1970 Beaulieu Vineyards Private Reserve Georges de Latour was fully mature, but pretty, soft and nicely balanced. Crushed flowers and a hint of tobacco lingered on the layered finish. 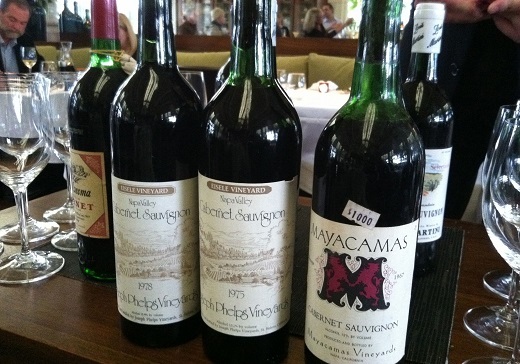 The 1974 Mayacamas Cabernet Sauvignon was impressive for its sheer density. There was more than enough going on in the glass to make up for a lack of clarity in the bouquet. This was a bit of an eccentric wine, but at nearly 40 years of age, I focused more on the positive than the negative, and there was a lot to like. The 1975 Chappellet Cabernet Sauvignon dazzled from start to finish. It was a towering, statuesque wine of heroic proportions. I would be thrilled to own the 1975. It was another of the many highlights of the night. Joseph Phelps’s 1976 Insignia was off the charts. The 1976 was made predominantly (94%) from Eisele fruit, so this bottle provided a fascinating contrast with the other 1970s Eisele Cabernets earlier in the evening. I loved the wine’s extraordinary bouquet and huge, explosive finish. It’s hard to say how long the 1976 will last, but it showed no signs of fading anytime soon. The 1976 Insignia is an American icon. It was an unforgettable bottle worthy of closing this great night of food and wine.